Earlier this year, the Alliance of Nurses for Healthy Environments launched the Nurses Climate Challenge in partnership with Health Care Without Harm (HWCH). The Nurses Climate Challenge is a nationwide effort to educate 5,000 health professionals on climate and health, with nurses leading the education. Nurses can visit nursesclimatechallenge.org and register to become a Nurse Climate Champion. Champions will then have access to a comprehensive set of tools to help them educate their colleagues on climate and health! Over the past year we have shared profiles showcasing the stellar work of the Nurse Climate Champions. This month, ANHE and HCWH are highlighting Champion Julia Ryder. Julia is a registered nurse at Bozeman (Mont.) Deaconess Hospital. As a participant in the Nurses Climate Challenge, Julia has been educating employees at the hospital she works and nursing students at the University of Vermont. 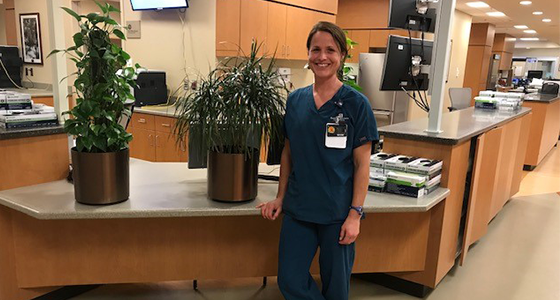 “My passion for nursing has been reignited with my commitment to bringing awareness about climate change,” Ryder said. “The effects of climate change go beyond the bedside and reach our community, friends, and loved ones. Now my nursing doesn’t only protect one patient – it protects my whole community.” Read her full story here. Inspired by Julia’s story? Join the Nurses Climate Challenge and make it part of your own!